At a GDC talk attended by PCGamesN, Failbetter Games’ Alexis Kennedy took to the stage to hand out advice for developers who are looking to go down the crowd-funding route, speaking about best practices when working visibly alongside a game’s community prior to launch. Failbetter Games clearly know their stuff. 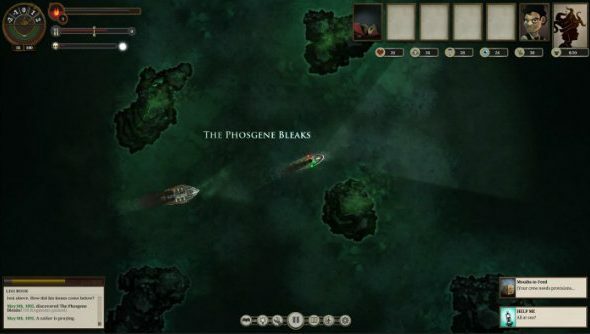 They got Sunless Sea onto out list of PC’s best indie games, after all. During the talk, Kennedy revealed he wasn’t the biggest fan of stretch goals for crowd-funded games. I hate stretch goals,” Kennedy said bluntly. “I think games get focused on the number, the score, at the expense of making a game.” He explained that it created a situation where developers were planning beyond the game’s launch, thinking of things like expansions before the game is even out the door. The extra money can easily disappear and be swallowed up by the development of the game, you see – you live by your means. There are two kinds of stretch goals Kennedy doesn’t mind, though. “One is: things you’re secretly gonna do anyway,” he laughed. “The other is: things that cost almost no money, and they’re cool and attract attention. Like this…” At this point he rolled up his trouser leg to reveal a tattoo of a lighthouse on his calf. He was paid 3.5k to get the tattoo and it cost him £60. “That is a bargain,” he exclaimed to rapturous applause. While it was lighthearted and a bit of fun, there’s a serious message in there too. Perhaps some developers do get sucked into the numbers game, and maybe this leads them to over-promise. It’s much better to aim for things that are interesting and low cost than to lock things like multiplayer behind a money gate. If it’s a game that would benefit from mulitplayer, make your Kickstarter target reflect that and get a sweet tattoo instead.